While Reading:The Treachery of Beautiful Things is a hard book to pin down. It is not a fairy tale, but it is. It does not take place fully in the modern world, but it does. Element upon element seem out of place, but in the overall picture, fit together perfectly.Beginning in the modern world, Long introduces us siblings, Jenny and Tom. Jenny is content reading books and allowing herself to take the back seat to her brother Tom's musical genius. Tom loves his music, but hates the pressures that his parents have forced on him. Their lives both change one day walking home as Tom is engulfed by the forest. Having lost her brother, Jenny is tormented by the event and vows to save Tom one day.There is something completely enchanting about The Treachery of Beautiful Things. From Jenny to Jack to the forest, The Treachery of Beautiful Things was a magical read. Long completely swept me off my feet. Taking me on a journey unlike one that I have taken before. I went into this book with not exactly high hopes. But just a few pages in and I was sold. I has been quite a while since I have enjoyed a faerie book this much.Final Verdict:With plenty of other faerie books to choose from, The Treachery of Beautiful Things stands out for exactly the right reasons. 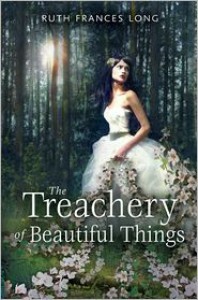 Full of adventure, romance, and a hint of mystery, The Treachery of Beautiful Things went way beyond my hopes and expectations.